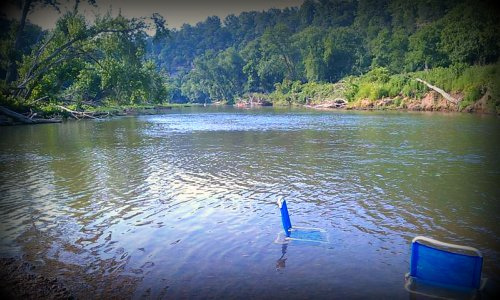 In the last week, I have dunked myself in the Harpeth River, taken a jon boat out on the lake at Montgomery Bell state park, and swum at the faux beach on the park’s lake. Today, we are going creek stomping and barn dancing in the country, about an hour into the green pastures that surround Nashville. I love summer in Tennessee. The water. The open fields. The country roads. Turtles, turkeys, deer, woodpeckers. All just outside my door. As I sprayed my tuna-white body with SPF 50 sunscreen this week, I had a deep longing for the days of coconut and piña colada-scented SPF-nada suntan oil summers of my past. My Miami Beach and Jersey Shore years. Ah, remember those carefree, screw-skin-cancer summers? The sand, the ocean, the hot guidos y papi chulos? And then the moment kind of passed. I slipped into the warm lake and splashed around with my husband and daughter, listened to the birds call in the trees and felt total love and joy for the right. here.right.now. I love the beach with red-hot passion, but I love the lazy river, lazy lake days we enjoy. A year ago as my community was recovering from the flood, we couldn’t access the river as easily, we didn’t have time to just splash around in a lake. What a difference a year makes. Though, if you look closely at the photo above, you will see trees knocked over. It doesn’t totally look normal yet along the river. But, we’re gratefully back to enjoying all of what a Tennessee summer offers. I wrote an essay over at fellow Nashvillian Jamie Reeves’ site, Blonde Mom Blog. The topic: Why I didn’t sign Maria up for a bunch of camps this summer. And because making paletas and ice cream is such a part of our summer this year, here’s a Tiki Tiki round-up of fabulous tropical fruit paleta and ice cream recipes. You will thank me. I know you worked so hard to help others in the area after the flood so I’m glad things have settled down for you and the family! Love the Frida pic, btw! I love the picture of the chairs in the lake! Such a relaxing vision of summer. Annakate, I wish I had known then what I know now. I wear hats too. My husband thinks I look a little ridiculous, but no way would I expose myself in the same way…gotta be a pretty vieja one day! We’ll plan a gathering…in the evening…no SPF! Joscelyn, complete heaven sitting in those chairs, te digo! You have me cracking up on the SPF bit. Smell of summer to me is Bain de Soleil Orange Gelee SPF 4…4! Mi madrina swore it gave us better color, lol. She must have missed the note that said we were brown to begin with! Like you I’m always hungry for the beach. And like you, the Jersey shore, hot spot on the beach days are waaay over. If I see a crowded beach, I run the other way to the quiet, deserted one where I can enjoy and take it all in. Thanks for the welcome back, Carla…and to you too! I know you’re back at it too. Creek stomping…. NO idea what that is but it sounds fun! Love the Frida pic, also. Who doesn’t love paletas de piña? Come creek stomping with me, and I will go to Mexico with you. We also survived a camp free summer. I bow down to two weeks of free daycamp with Jesus (VBS) and my awesome parents and inlaws for pitching in on numerous occasions. We did it! We deserve a drink, no?